This project is perfect for honing small project skills, where precision is required. It starts with a few simple table saw cuts, but incorporates a variety of precise router table setups to make the joints fit tight to one another. I choose this particular model after seeing it featured on the Woodsmith Shop television show (Season 6, episode 2). Free plans for this build are available here. I built seven of these just before Christmas. I made two of oak, one black walnut and four a rich brown walnut. I stained the oak models, and then finished off with a number of coats of Tung Oil. 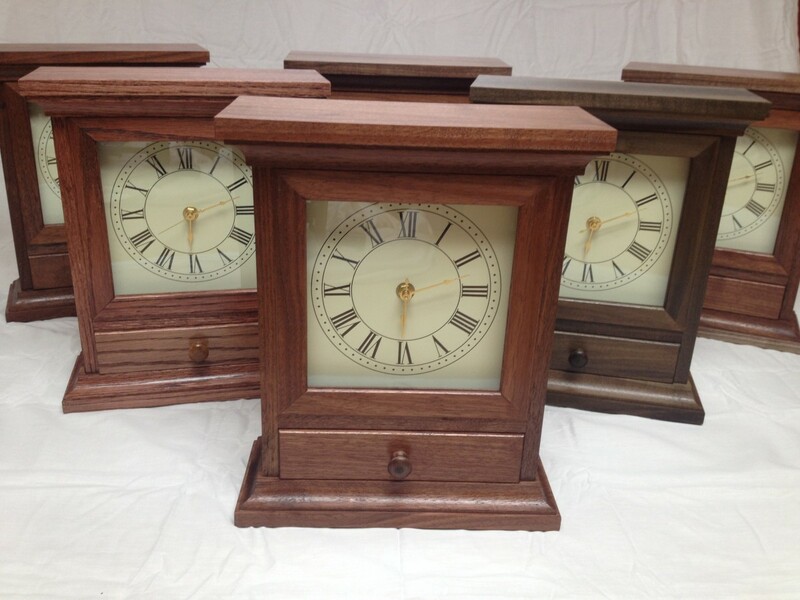 The walnut clocks just got the oil coating. 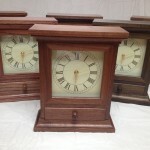 The clock face was ordered from Klockit.com, referenced in the free plans. The clock works came from Hobby Lobby and the glass was purchased at Lowe’s. This is an rewarding build, and building more than one at a time is an economical use of time. My total time in the shop for the seven was around 15 labor hours. Be the first to comment on "Mantle Clock"